TemplateHack.com - Download Fib Mag premium blogger template. Fib Mag is magazine blogspot template with old design but gold feature. Fib Mag don’t have minimalist design, this template built with complex design, like an old template. But this template has many features to make your blog can compete with other similar blog on Google search engine such as search engine optimization, social bookmark, drop down sidebar, and ads section to place your ads on your blog. Featured post, red, white, page navigation menu, drop down menu, 1 right sidebar, 1 left sidebar, 3 column, ads ready, post thumbnails, search box button, red, white, social share button, social bookmark ready, simple, clean. 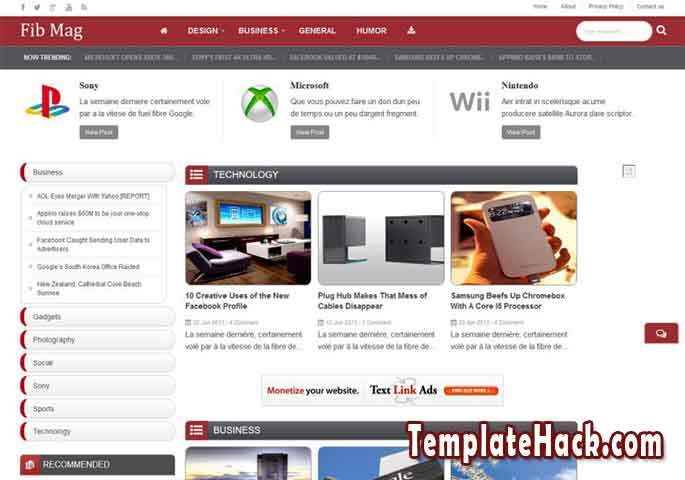 tech blogger template, technology blogger template, magazine blogger template, tutorial blogger template, news blogger template, portal blogger template, personal blogger template, business blogger template, photography blogger template, sports blogger template.